AI-powered insights. Through artificial intelligence, machine learning, automated statistical analysis, and benchmarking, Suplari delivers actionable insights for investigation and resolution, and also keeps a record of value delivered. Complete, unified supplier data. 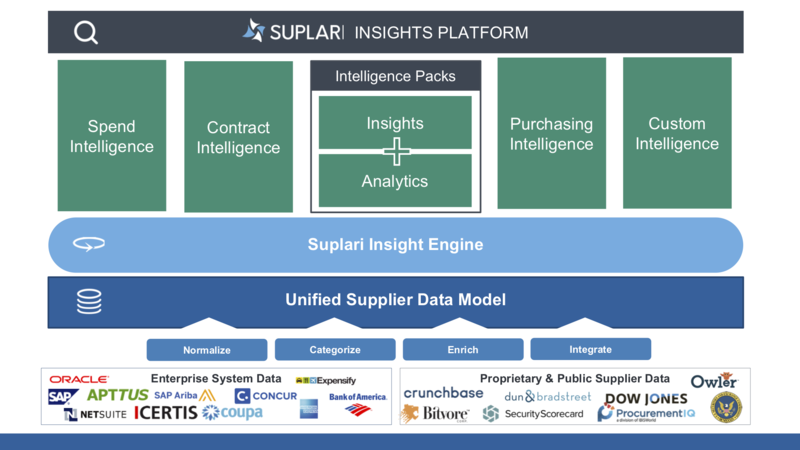 Broader than just spend analytics, Suplari integrates, normalizes, and categorizes siloed data sources from your enterprise systems including contracts, invoices, POs, accounts payable, travel & expense, corporate card, and consumption into a comprehensive supplier data model. Powerful out-of-the-box analytics and workflows. Simplified analytics, workflows, reporting and scorecards that are easy to use, easy to share, and alerts-driven. Everyone in the organization will have the same view of each supplier’s spend, usage and value to the enterprise. Real-time updates through interaction with existing systems-of-record and flexible data uploads. No IT, professional services or rip-and-replace. Suplari delivers value quickly by sitting on top of and working with existing enterprise systems. No need to queue for an IT project. No lengthy consulting engagements or changing processes or tools. Up and running in weeks; payback in months. 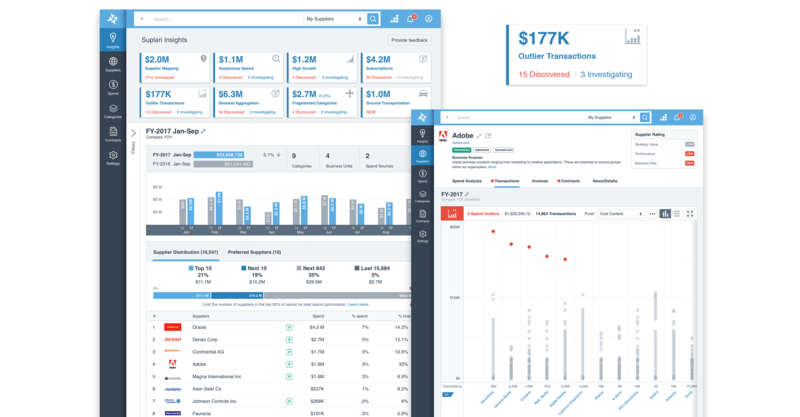 Suplari’s Unified Data Platform pulls in disparate data from existing systems from across the entire enterprise – contracts, spend across AP, P-card, T&E, POs, and invoices, as well as usage and consumption data. A complete view of your entire indirect supplier base. Suplari democratizes procurement intelligence and reporting with powerful out-of-the-box capabilities.